The villa is located in Marina Serra (Tricase) a quiet place a few kilometers from Santa Maria di Leuca and its sanctuary, the resort is nestled in one of the most breathtaking and unspoiled landscapes of Puglia: the high rocky coast between Otranto and Leuca's Cape, a protected area by the natural regional Park. The villa is in a peripheral position with respect to the small place of Marina Serra with no vehicular traffic and overlooks the sea, which is very easy access to the other side of the street in front of the villa plus a beautiful accessible natural swimming pool at 150 m, recently subject of an article in Vanity Fair for its beauty. Several accommodation available in the villa to suit your needs. We have 3 apartments with 3/2 bedrooms and a studio apartment is on the first floor with a panoramic terrace on the ground floor next to the garden. The 3rd apt have 3 bedrooms, 2 bathrooms and a huge double panoramic terrace with vegetable garden but it is available in low season only (until June and from September). The biggest type apartment consists of a living room with kitchen kitchen, three bedrooms (with two beds in each, plus one extra bed) and 2 bathrooms, one of which is in the room. In the lounge there is a double sofa bed. We also provide a free cot for the little ones. The same type is available on the ground floor or you can request an apartment with two bedrooms and a large veranda or a studio flat with kitchenette in the covered veranda, and with a shady relevancy outdoor veranda. This is also suitable for couples with one or two small children. Please, ask us about costs for the various solutions. The larger apartments can comfortably accommodate 6 people, but you can also have 10 beds with a total of 30 in all three apartments. Me and my family spend the summer in another apartment in the villa. Our children Robert of five years, Anita and Richard of 13 and 10 often make common cause, together with their cousins ​​and friends, with our youngest guests both in games in the garden and in the dips in the sea and in the afternoon and evening autonomous"outputs" as far as the place is very quiet and safe from this point of view. Our stays are from Saturday (entry after 14:00) to Saturday (exit by 11:00). In low season (until June and from September onwards) can be arranged different days/times of entry/exit. On request and for a fee we provide linens and towels set. We have the ability to accommodate larger families and groups of more apartments with spacious areas like the large veranda facing the sea on the ground floor with pergola or roof terrace on the first floor. All solutions are equipped with free satellite TV with Sky box or decoder for use with smart cards of guests. Outside space, garden with children's games, shaded parking, communal washing machine. In the place, 100m, there is a small port with free mooring unguarded ideal for small boats, canoes, etc. Numerous associations in the area organize trips, hiking, boating, etc., such as www.associazionearches.it, www.vialeucadensis.it, salentoinbarca.it. Thanks to Antonia and Guiseppe we had wonderful holiday in beatuful part of south Italy. The country, people, food and wine are just perfect there. We hope to come back one day. Thank you so much. I'm glad you were well in our house. You too have been fantastic guests. I hope to meet you again soon. Quel plaisir de regarder la mer au levée du jour ! Maison de vacances à quelques pas de la mer où on peut se baigner (ne pas oublier les chaussures de mer) dans une eau chaude et limpide. MARINA SERRA se situe à 4 kms de TRICASE où on trouve toutes les commodités. C'est un point de départ idéal vers Otranto d'un côté et Gallipoli de l'autre afin d'explorer la diversité des plages et des côtes du SALENTO . Nous avons passé 15 jours très agréables. Merci à Giuseppe pour son accueil et son aide. Merci Christophe, je suis heureux que vous ayez eu un bon moment chez nous. Aussi, vous avez tous été très agréable. était un plaisir de vous avoir comme nos invités. J'espère vous revoir. Casa accogliente a due metri da un mare meraviglioso. Proprietario gentile e disponibile. Punto di partenza per vedere tutta la costa del Salento con i suoi splendidi paesaggi. 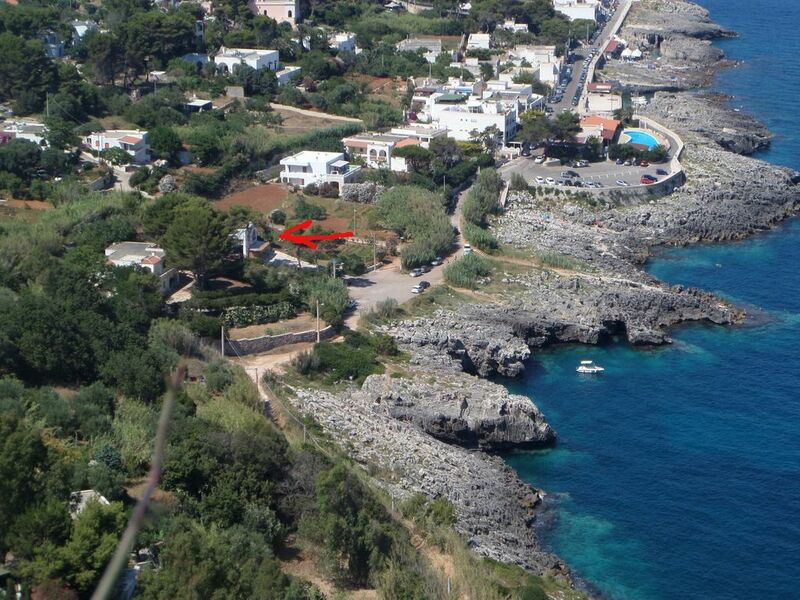 By plane: the nearest airport is Brindisi which is 100 km far, then Bari, 220 km far. by car: take the motorway (A14) until Bari North (Bari Nord) and continue for Brindisi-Lecce. Once in Lecce continue to Santa Maria di Leuca until Montesano Salentino. Here follow for Tricase and then Marina Serra. Although the place is very quiet you can find a pub-pizzeria with live music and an excellent seafood restaurant. In summer time in Salento there are numerous cultural events based on our traditional dance, the “Salento’s Pizzica” with the famous musical festival "Notte della Taranta" (Taranta’s Night) held in Melpignano (30 km far) in late August. There are also several culinary festivals based on the tasty local traditional dishes and religious celebrations during which the towns are decorated with spectacular illuminations locally named “luminarie” and fireworks.